The lady at the tour desk told me. 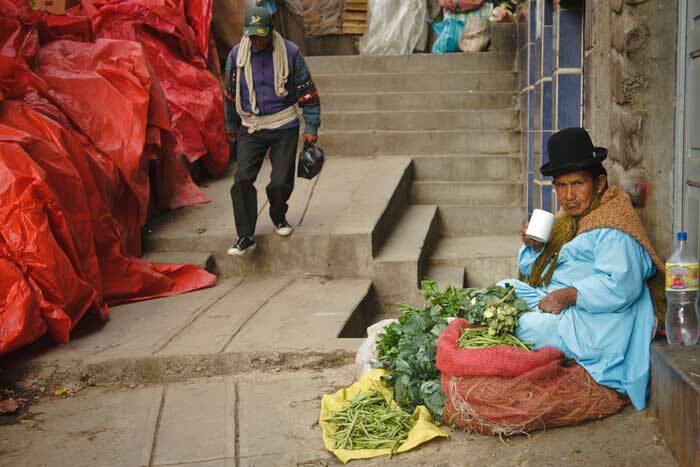 I’ve read and heard stories about it: El Alto is not the safest place in Bolivia, and tourists are uncommon. But even then, El Alto has its own merits and I gotta see it for myself. El Alto (‘The Heights’) was once a satellite city of La Paz, the administrative capital of Bolivia. 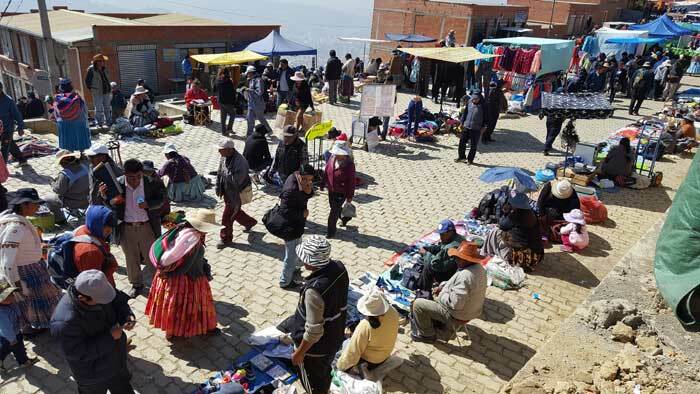 An influx of people seeking better life migrated from the rural areas to the city, causing the population to ‘spill over’ to the hills and neighbouring El Alto. 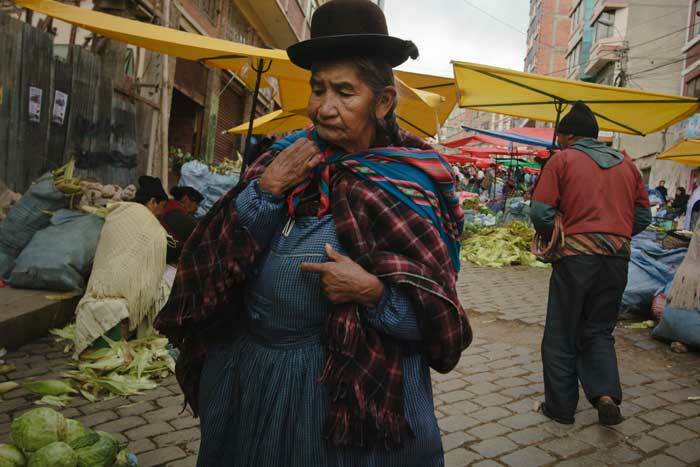 El Alto has the largest population of indigenous people in South America, and in 1986, it was politically separated from the City of La Paz and became self-governed in 1987. Currently, El Alto has a population of 1 million, more than that of La Paz, and is the highest major city in the world at 4150m. In truth though, El Alto feels more like a suburb than a city. The tremendous growth in population caused major problems for Bolivia’s government, in terms of housing, water supply and sewerage. It is also one of the most ‘rebellious’ city, holding frequent protests and crippling strikes. The traffic is chaotic with cars honking every second and minibuses getting stuck. My journey to Tiwanaku was twice as long when the minibus was caught in the El Alto traffic. Yet, all routes in and out of La Paz passes through El Alto. In a sense, this satellite city ‘controls’ the roads and can shut down the city if they choose to, like Gods up high looking down into the ‘pit’ that is La Paz. So why would I want to visit this less-than-appealing city? On every Thursday and Sunday, El Alto holds its most well-known ‘tourist attraction’, even though there are hardly any tourists. 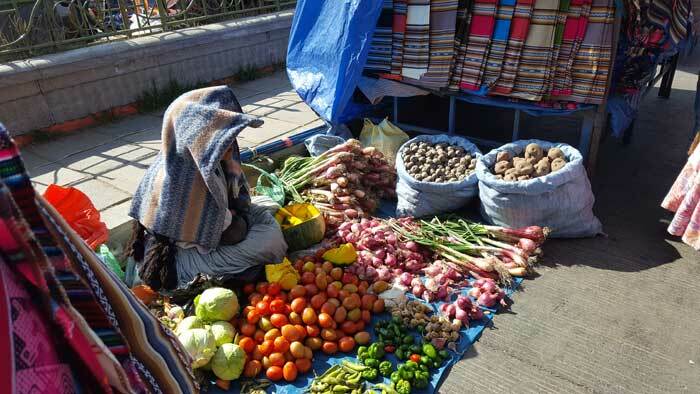 The 16 de Julio Market is the biggest open-air market in Bolivia, covering an area over 5 square kilometres. Most people say that it sells everything that you can imagine. I’d like to think of it as it having everything that you don’t need. 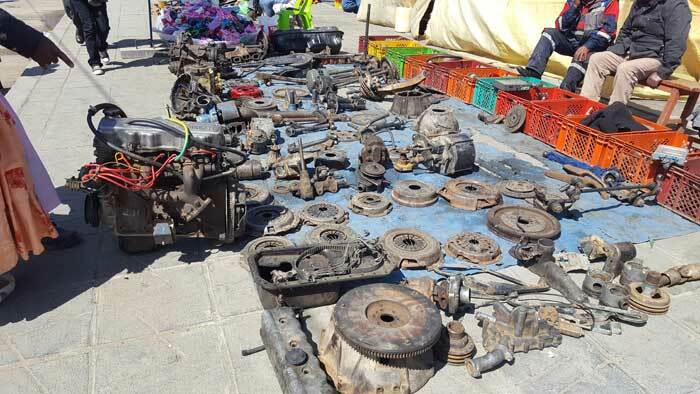 Stepping right out of the Mi Teleferico station, I see car engine and spare parts lying everywhere and the vendor was an indigenous lady. Now that’s not a sight you see every day. The most amazing was the furniture area; with huge cupboards and sofas and dining tables. I wonder how they are going to transport those in a city like this. Like I said, they have everything that you don’t need. The best part about this market is the ridiculously cheap prices of the stuff here. You can buy used coats at BOB $30 (USD $4) or a suit at BOB $100 (USD $14). 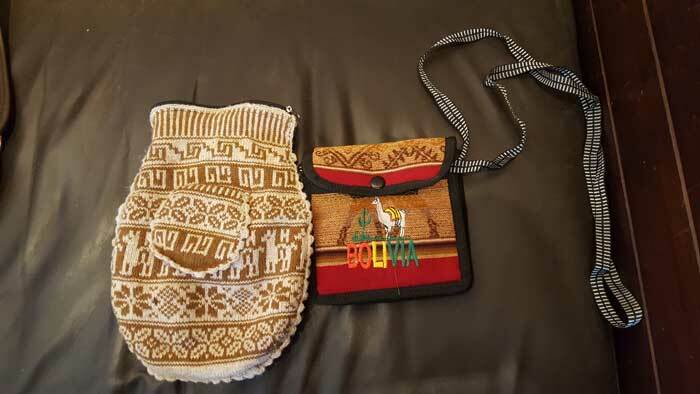 I got myself a USB drive and some small bags that were weaved with indigenous Bolivian styles, perfect as my current cases were tearing apart. There were hardly any tourists when I was there, and vendors were shouting to attract customers while kids were kicking about anything they could find. 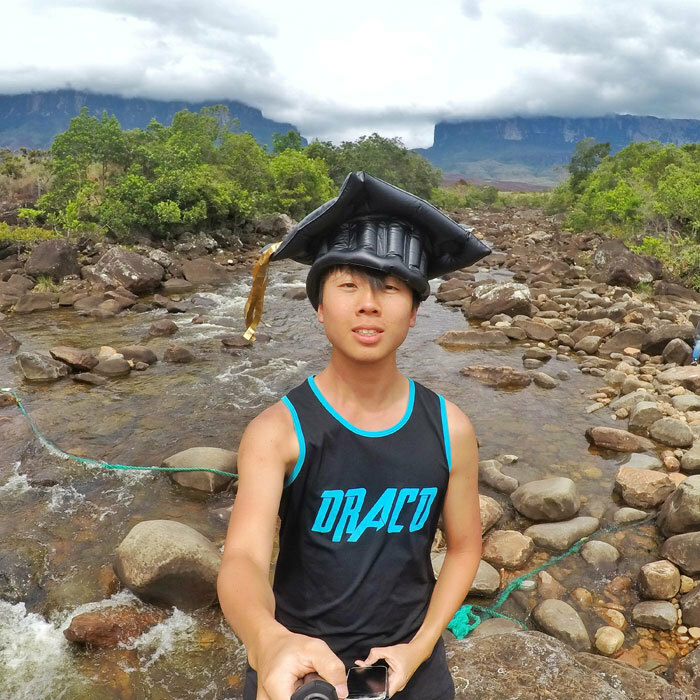 This is about as local an experience as one can get. I went in the day and did not bring a bag or camera. But despite the warnings I received, I did not feel any more unsafe than the numerous night markets I’ve been to. One thing to take note is to get your bearings right before entering. It felt like a maze in there. 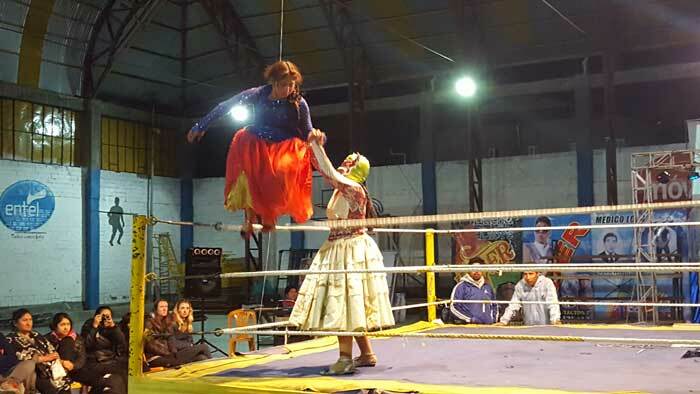 Also on Thursdays and Sundays at El Alto is one of the oddest and most incredibly unique experience: Cholita Wrestling. To put a little context: Cholitas are the indigenous women of Bolivia, seen wearing the colourful traditional full skirts and bowler hats (left over from British colonialism), with their long black hair in braids. 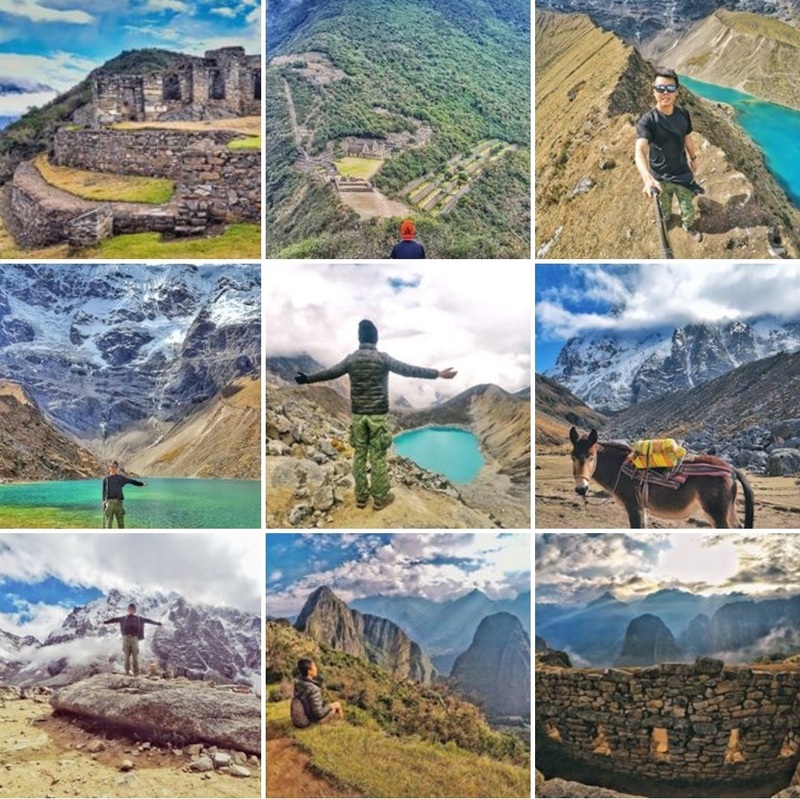 Unlike many cultures, these elaborate costumes are not put on for tourists, but an act of habit, a reflection of the Quechua and Aymara traditions that lives on. Cholitas are not without a difficult past; they were once considered the lower echelon of Bolivia society - much like the lower castes in India – and were barred from various neighbourhoods and restricted to low-paying jobs like a roadside fruit vendor. It wasn’t until 2006 when Bolivia elected Evo Morales – the country’s first indigenous presiden﻿﻿t – that the indigenous people were deemed equal by the rest of the society, taking on more professional jobs like lawyers and doctors and, surprise, professional wrestlers. 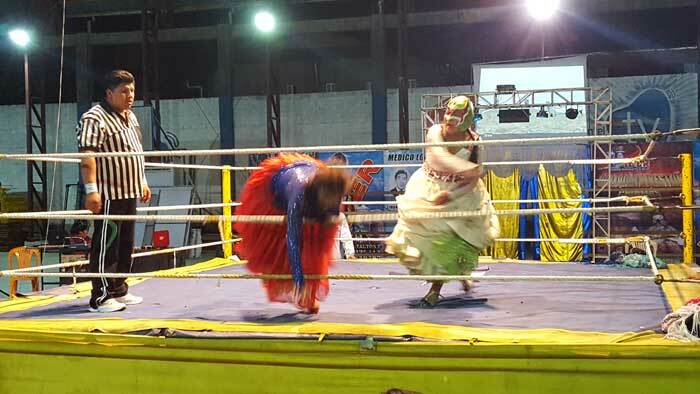 And Cholita Wrestling is exactly that: The indigenous women fighting each other, Mexican lucha libre style, to entertain a crowd. Feminism and indigenous pride! It sounded extremely interesting for me that I signed up for a tour. It is possible and cheaper to go there by yourself, but El Alto is known to be dangerous at night; the matches are held at night. 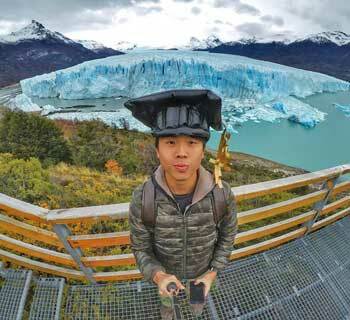 There are numerous tour agencies offering the experience. It costs BOB $80 - $100, depending on the day and the agency. I got picked up at 6pm and the bus was filled with drunk tourists, ready for a good time. The guide made sure to emphasize that our entry includes VIP ring-side seats, snacks, a soda, a souvenir and most importantly, two entries to the toilet. I lol-ed. The arena was a giant tin shed, some parts still under construction. It was freezing cold. Tourists filled the ring-side plastic chairs while only a handful of locals sat at the cement steps at the back. I was told that it is cheaper on Sundays when the arena is more filled, probably with locals. The night started with a warm-up match of male wrestlers fighting each other in the ring. They wore pink trousers, yet grunted ever so macho-ly. At one point, one of them took a bottle of soda from the snacks store and poured it all over his opponent. This got the crowd real fired up. Then, a little kid came on stage and dropkicked the guy that was beaten up. This sealed the match and it was over. We did not wait long for the main event of the night. Traditional music came on when the Cholitas made their appearance in their full costumes, bowler hats, jewellery, puffy skirts and all. They strode around the wrestling ring while waving at the cheering fans. All hell went loose when the match started. These demure-looking ladies turned violent; slapping, slamming, arm-twisting and of course, hair-pulling. What is a fight amongst ladies without some hair-pulling? Like all wrestling matches, it was dramatic. They leaped from the top ropes, choked-hold, and even fought with a chair. Not a steel chair though, just a plastic one. At one point, like the men before them, they took a bottle from the audience and sprayed it onto each other. The villain gains the upper-hand, beating up the ‘good Cholita’ in a one-sided match. Once in a while, the corrupted referee comes in and sneaks in a few kicks. This went on while the crowd boos at the villain. When it looks like the villain is gonna win, a good referee comes in to save the day. He distracts the corrupted referee, and counts down when the good Cholita overturns her misfortune and pins the villain. The crowd goes wild when the poor good Cholita wins. 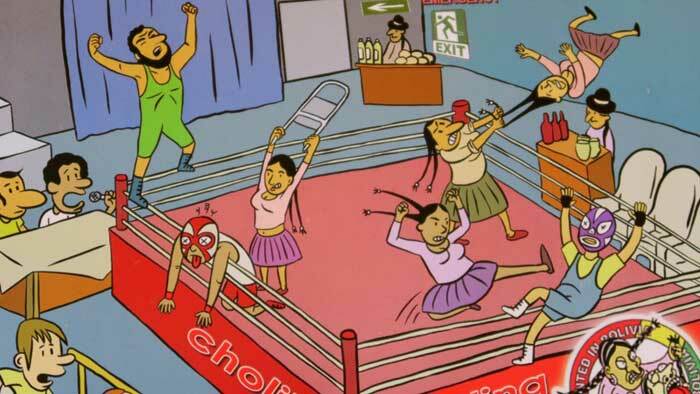 Repeat the same storyline 3x and that is the Cholita wrestling for you. The good Cholita always wins. The whole experience is extremely fake but I was thoroughly entertained. The Cholitas were basically acrobatic entertainers, but they did a great job when they went off-stage and getting the crowd involved. If you treasure your drink and dignity, don’t sit at the first row. We arrived at 7 and left at 8, but it was more than enough since the storyline doesn’t change. Some bored spectacles went to the photobooth at the side to pose with the Cholitas. 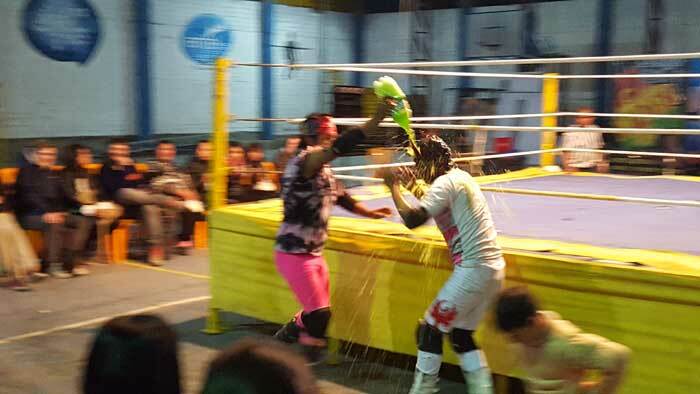 Watching a Cholita wrestling match is definitely a once-in-a-lifetime experience and the only place to do so is in El Alto. You will laugh, I guarantee it. To get to El Alto from La Paz, there are local white minibuses (called colectivos) from San Francisco Plaza with signs on it. You can’t miss them. It takes around 30 min and the bus ride costs BOB $2. The other way is to take the Mi Teleferico (cable car) up to El Alto. It is more comfortable, has better views over the city and costs BOB $3 (USD $0.50). 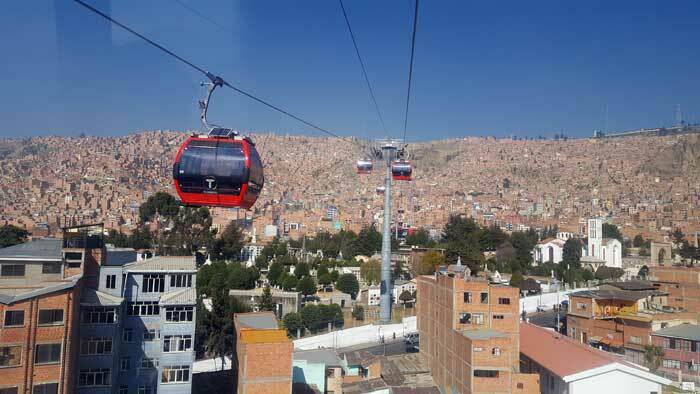 Taking the cable car is an experience in itself, and recently has become the number one activity to do in La Paz on TripAdvisor.